Welcome friends! 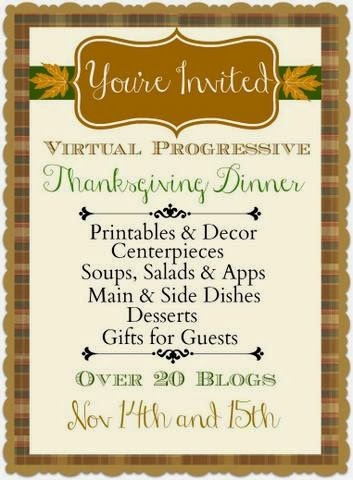 Glad you could join me for the Virtual Progressive Thanksgiving Dinner blog tour! Nothing compares to a beautiful center piece for the holidays. I realized that if you are cooking a big meal, sometimes the center piece is the last thing you want to worry about. Fortunately, this one you can make a head of time with just a few simple supplies. You could use any combination of fruit in this arrangement. I bought what was on sale. I choose not to use tooth picks to anchor the fruit, because I want to be able to eat it later. The Mason jar rings hold the fruit in place and keep it from rolling about on the tray. I began by planning out where everything would go on my tray. The foam in this photo turned out to be too large, so I switched to the smaller pieces. I nestled the fruit inside the Mason bands, it will get covered up with the greenery in the end. I pushed 3 candles down into the floral foam in the center of the fruit. I trimmed the greenery into 3″ pieces and stuck them into the foam. Then the roses were cut with stems about 2″ long and poked into the foam as well. The object is to cover as much of the foam as possible with the roses and greenery. Don’t forget to add the leaves from the rose stems. I put leaves under and next to the fruit as well. The Mason jar bands completely disappeared in the arrangement. The last step is to add water to the tray. The flowers soak up considerable water, check it frequently by touching the floral foam with your finger. If it is dry to the touch, it needs another drink. I do not recommend using Floral Fresh in this arrangement since the fruit is touching the water. You could add a bit of 7UP soda to it and extend the life of the flowers. The arrangement will last about 5 days. Easy to make in advance of the big cooking day. I think you could easily expect to purchase an arrangement such as this and spend $40.00 or more, this one cost me less than $12.00 to make. A few mini-white pumpkins really bring out the color of the roses in the center piece. Be sure and check out these other blogs on the tour!